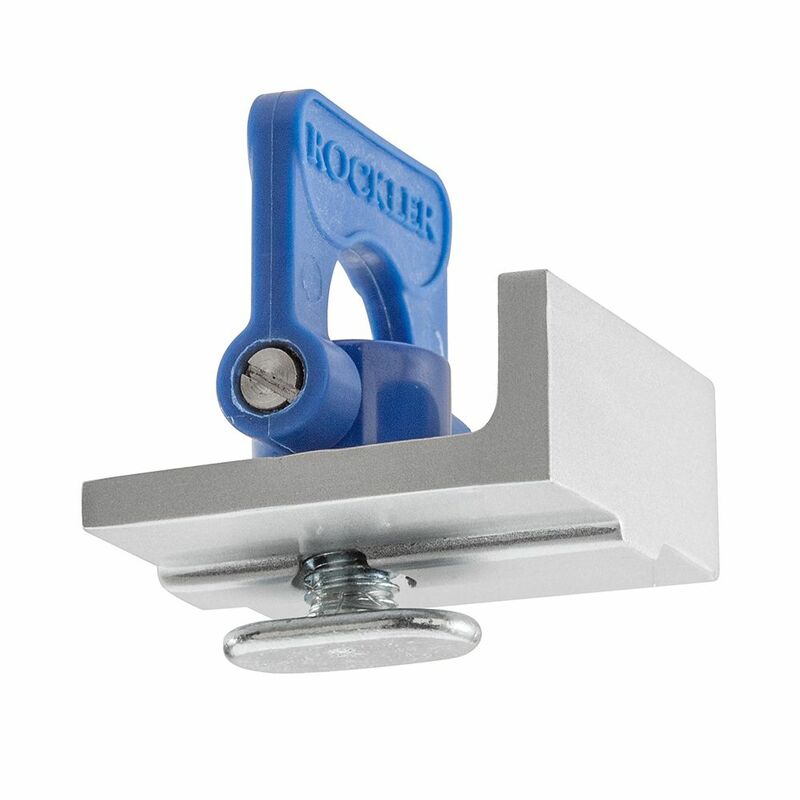 Pair these stops with our T-Track Table for a fast, accurate work holding solution! 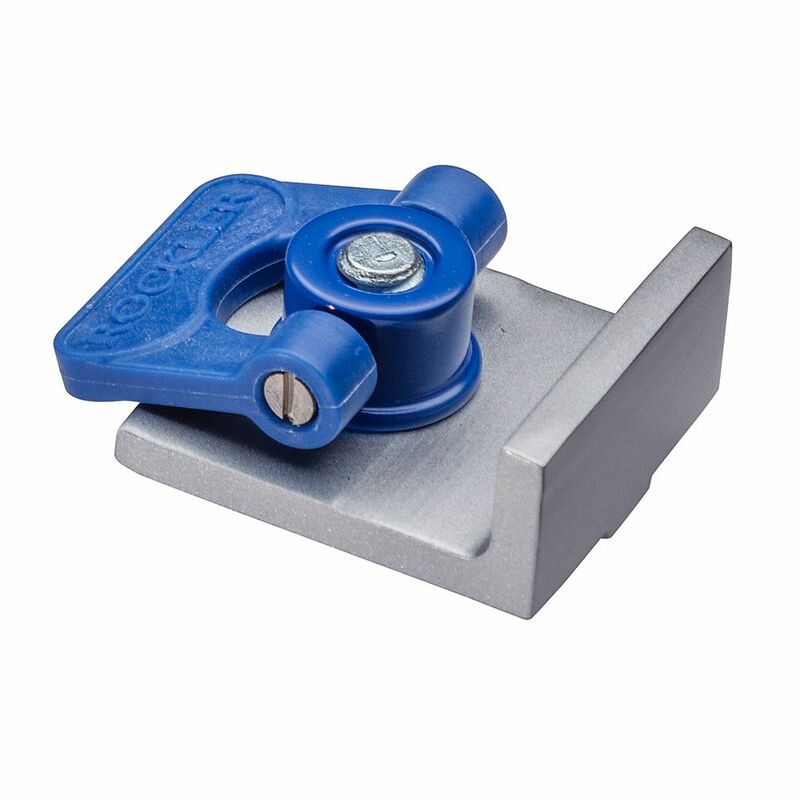 Combined with your T-Track Table, these stops give you a fast, accurate work holding solution for a wide variety of applications. 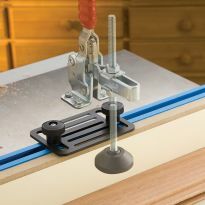 The stops feature low-profile knobs that fold flat for easy clearance when sanding or machining. Inline Stops are useful when you want to sandwich a board between two stops so you can scrape, sand or plane in either direction. 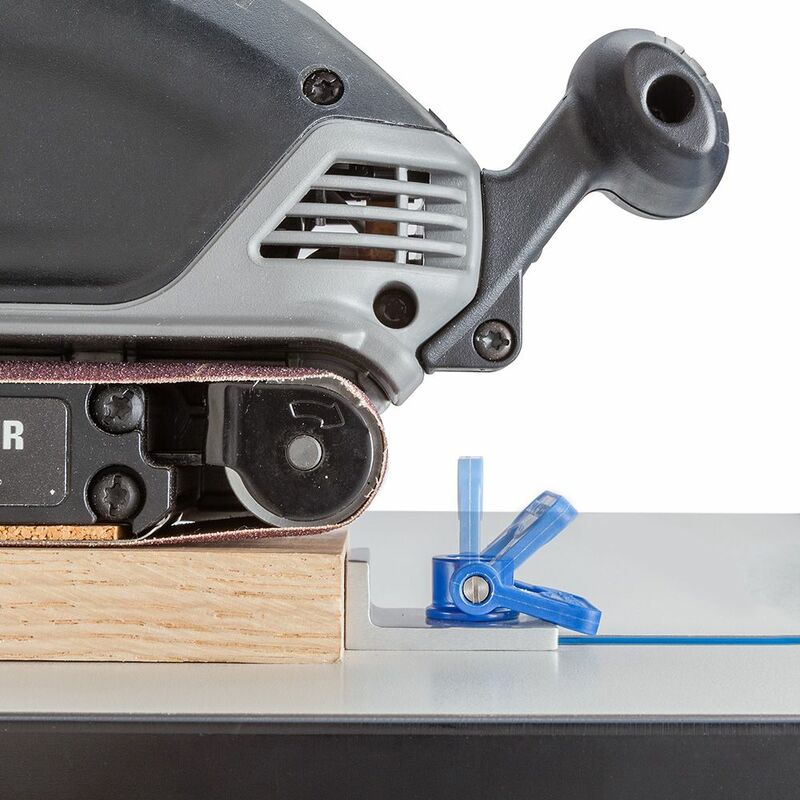 If you need light clamping pressure, tap a pair of carpenter's shims between one of the stops and you have a very secure holding system for light routing tasks or carving. 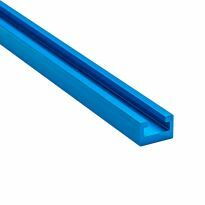 The keyway on the bottom of the Inline Stop runs perpendicular to the stop face. 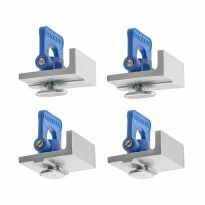 Two other stop styles are available separately: Short (#50603) and Long (#53845) both with keyways parallel to stop face. These are great! Can't beat 'em. Product works great and is a valuable tool for my CNC machine. The product is fine, but I am disappointed in the fact that both on line and in the retail store they would not honor the sale price clearly stated in the April catalog. The retail outlet did not even have a current catalog. These stops are super convenient and easy! 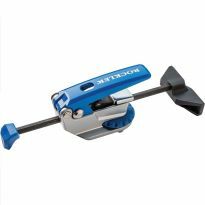 While these are a great deal at $8 and you really need nothing more, they need modified to work in the other brands T-Tracks since Rockler felt the need to make it a proprietary system. If you have a system worth buying, it's not worth making it proprietary. 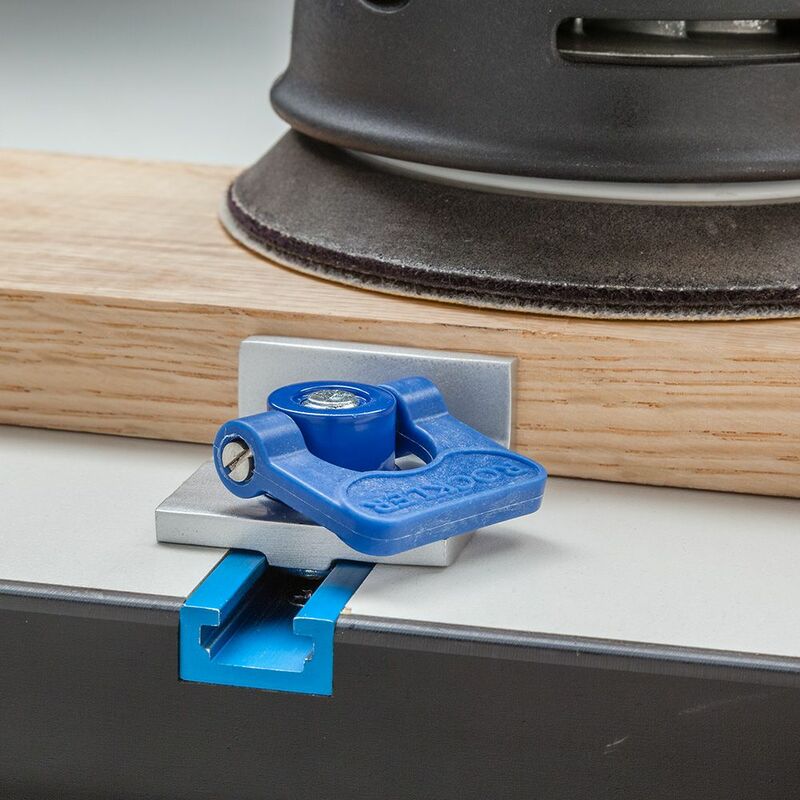 They are useful with my Rockler worktable that has tracks in both directions, but they don't hold at all if you are pushing the workpiece against the stop parallel to the direction of the track. They only work pushing vertically relative to the track they're in. 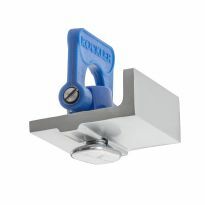 Bought several recently and although well made, the clamp reach is not adjustable and so has limited use. I managed to make my own with a longer reach for what I need. Another thing to consider is the direction of the bottom guides as they will only work in only one of two possible directions so you will need to decide this before buying. I bought 6 of these and had them sent to the UK. 5 of them worked fine but one would not tighten at all and slid freely along the t-track. The problem was caused by poor machining on the flange that sits in the slot in the top of the t-track. It was thicker at one end, and the bolt tightened on the flange instead of the t-track. I had to grind it down so that I could get the bolt to grip on the t-track. 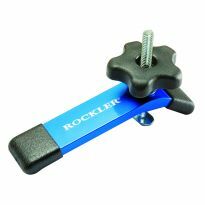 The reason for 2 stars is for Rockler support or (lack of) ... I emailed them, to point out the mistake to them, and no one bothered to reply. Purchased 14 of these for a production assembly fixture along with T tracks. 3 of the 14 "wing" nuts came with one of the side bolts missing. 3 more had the side bolts come out during initial assembly. Tried to put the side bolt back in but the threads were stripped. Decided to give up and replace the "wing" nuts with 5/16"-18 thumb nuts. New nuts would not even start to thread on the T bolts. Tried other standard 5/16"-18 hardware and the same thing, would not work on these "wing" nuts. These T nuts are zinc cast, not machined so only fit the "wing" nut supplied. Gave up again and purchased 5/16" 18 x 3/4" carriage bolts. I have a Bridgeport milling machine so I turned the carriage bolts into T bolts. now I can use my thumb nuts. The poor material used (plastic wing to tighten the nut?? ?, non standard threads, weak assembly) made a good product idea a failure. I was lucky to be able to custom make a replacement T bolt to use standard thumb nuts or my fixture would still be sitting in a corner unused. Not sure how other reviewers for these great! 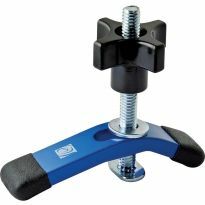 Maybe Rockler changed the design on the items I received? Did not order and have not received them. got notice that they would be here today, but have not received them. These should work well with my new t-track. Might need em one day and got it on sale . Just put in a Rockler t track system in my work bench . Little things like these make wood working a little more easy and fun for me . For making a mortise jig for router. 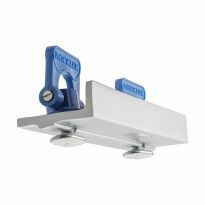 Need a simple quick set and adjustable stop solution. To use on a table I am building for my chop saw. I need some way of stopping. "Stops"are one way. good product at a great price. just needed more. Adding to my work bench T track system. i need them for my router table i have the other ones already. Now, this looks like it bill be really useful. let's try a couple and see. CAN'T GO WRONG WITH A FLIP LEVER STOP, NO MORE FUMBLING AROUND LOOKING FOR SOMETHING TO USE AS A STOP. Ned a stopper for sanding or planing. Needed for some current projects. One man shop, need all the extra hands I can get. We just constructed a second assembly bench and I think this system will solve some basic clamping processes. What is the thread size for the screws that hold the tightener? BEST ANSWER: the thread is a 5/16-18 X 7/8" or 1"
No screws. Uses t track. I'd like to use something like this on my cnc router table, which has a thick spoil board. Can I put a longer t-bolt in it to account for the thick spoil board? BEST ANSWER: I use it on my cnc but I routed and installed a t channel in to the spoil board, but it should allow a longer t bolt.